Hanoi (VNA) – Armed criminal groups attacked Indonesian election organisers and security forces in Alama district, Papua province, on April 18. It is unclear if the attack resulted in any casualties. According to Lieutenant Colonel Pio Nainggolan, the gunshot took place in early morning and was allegedly directed at personnel tasked with securing the election in the district. The local security force fired back, while two army helicopters were used to evacuate the attacked groups. A total of 28 election organisers, police officers and logistic staff were transferred to a safe location, he said. The evacuation was carried out simultaneously with work to protect the C1 Plano document, which contains the district’s results. The document is now kept by Mimika Regional Police for submission to the Indonesia’s election commission (KPU). Other documents were still trapped in Alama. Indonesia opened the polls to more than 192 million eligible voters on April 17 in one of the world’s biggest single-day elections. For the first time, the country held its presidential and legislative elections on the same day, with more than 245,000 candidates running for more than 20,000 seats. Initiate an independent audit of the effectiveness and human rights risks associated with all programs involving Indonesian police and military receiving Australian Government funding. TAPOL and the East Timor and Indonesia Action Network (ETAN) are calling attention to an application for judicial review of the “Act of Free Choice” by the Indonesian Constitutional Court. Recently filed by human rights lawyers on behalf of West Papua customary leaders and churches, the submission states that the highly contested self-determination “referendum” held in 1969 must be deemed contrary to the rights granted under Indonesian constitution, including the rights to freedom of thought and conscience, right to life, right to feel safe, and the right to not be tortured. The “Act of Free Choice” took place between July 14 and August 2, 1969. It was implemented following the guidelines of the New York Agreement (Agreement Between the Republic of Indonesia and the Kingdom of the Netherlands Concerning West New Guinea (West Irian [West Papua]) of August 16, 1962. The New York Agreement set the terms of the self-determination process. The UN was to assist Indonesia in overseeing an exercise of free choice by the people of West Papua on their political status, choosing between independence or remaining under Indonesian control. There was to be full participation by all adults in accordance with best international practice. However, there was no meaningful support from the United Nations to guarantee a freely-held vote. Instead, Indonesia took control of the process and backed by threats from its military, hand-picked 1025 men and women and forced them to vote for annexation by Indonesia. It is why West Papuans refer to the referendum as “Act of No Choice”. The referendum was by no means a legitimate exercise of self-determination. This strategic litigation reminds the international community about the root cause of the longrunning conflict in West Papua. The right to self-determination is an erga omnes norm which means that every State has the obligation to ensure that everyone’s right to self-determination is fulfilled. This 50 years of injustice has cost the loss of hundreds of thousands of indigenous West Papuan lives. West Papuans today still suffer persecution for expressing their rights to self-determination. We encourage the Indonesian government to accept the submission and to acknowledge that the vote staged in 1969 was contrary to rights granted under the Indonesian Constitution. TAPOL and ETAN each work to promote human rights, justice and democracy in Indonesia and Timor-Leste. The groups join West Papuans in calling for an internationally-supervised referendum conducted according to international standards. (Jakarta, April 10, 2019) – Political changes in post-Suharto Indonesia have triggeered ethnic and religious violence across the country, says a book by Andreas Harsono, a veteran Indonesia researcher for Human Rights Watch, that was published today. The 280-page book, Race, Islam and Power: Ethnic and Religious Violence in Post-Suharto Indonesia, was published by Monash University Publishing a week before Indonesia’s general elections on April 17, 2019. Harsono spent five years travelling around Indonesia, from the westernmost island of Sabang to its easternmost city of Merauke in West Papua, from Miangas Island in the north, near the Philippines border, to Ndana Island, close to the coast of Australia. Harsono’s journey took him to more than 90 locations, including 41 small towns and 11 remote islands. Many of those locations were the sites of either state or communal violence. "Indonesia is not only the largest country in South East Asia—but also the mosst populated predominantly Muslim country in the world," said Nathan Hollier, the director of Monash University Publishing. "We hope this book will contribute to a deeper understanding of the social dynamics on the ground within this highly diverse, complex and important nation." President Suharto’s momentous resignation in May 1998, after three decades in power, triggered political changes in multiethnic, multireligion, and multilingual Indonesia. Many ethnic and religious groups promptly tried to find new equilibrium, demanding more say in their political, economic and cultural domains. Some became involved in bloody conflicts within their borders. Harsono spent 15 years researching and writing his book, documenting how race and religion have come to be increasingly prevalent within Indonesia’s politics. He estimates that at least 90,000 people were killed in mostly communal violence in the decade after Suharto’s departure. Today, impunity remains a huge problem in Indonesia. Many candidates for local and national office in the upcoming election, including a presidential candidate, Prabowo Subianto, and a vice presidential candidate, Ma’ruf Amin, were implicated in notorious human rights abuses but never brought to justice. "When Andreas Harsono returned from his Nieman Fellowship at Harvard University in 2000, he introduced long-form reporting in Indonesia, writing and editing literary news reports," said Elaine Pearson, Australia director at Human Rights Watch. "In 2008, he joined Human Rights Watch, researching human rights violations across Indonesia. He combines his literary reporting skills and human rights training in this travelogue, seamlessly integrating his visits to many mass graves with academic analysis." Human Rights Watch is an international organization with its head office in New York, working in nearly 100 countries, uncovering facts that create an undeniable record of human rights violations. Its staff are experts on the countries and human rights topics that they cover. Some have published books to reflect at greater length on relevant themes and events. Monash University Publishing is the publication arm of Australia’s largest university with four campuses in Victoria (Clayton, Caulfield, Peninsula, and Parkville), one in Selangor (Malaysia) and one in Johannesburg (South Africa). Monash also has a training center in Prato (Italy), a research academy in Mumbai (India) and a collaboration with China’s Southeast University in Suzhou (China). It publishes books on humanities and social sciences, specializing in Asian Studies and the study of Australian history, culture and literature. Sumatra: Aceh militants fought against Indonesian rule since 1976. Many outer islands, such as Sumatra, had to adopt Javanese culture if they wanted to get financial support from the government in Jakarta. But the devastating 2004 tsunami in Aceh led to a peace agreement between militants and the Indonesian government, ending the three-decade conflict. Aceh also adopted Shariah (Islamic law), introducing discriminatory regulations against religious and gender minorities. Kalimantan: In 1997, ethnic Dayak militants killed ethnic Madurese, who originally came from Madura Island. In 1999, a bigger massacre took place around Sambas, western Kalimantan, in which ethnic Malay militants killed about 3,500 Madurese settlers. In 2001, that deadly ethnic violence spread to Sampit in central Kalimantan, where Dayaks killed about 2,500 Madurese settlers. Sulawesi: Ethnic Minahasans rebelled against Indonesia in the 1950s. This Christian-majority area has managed to avoid the sectarian violence experienced in neighboring Moluccas provinces and around Lake Poso in Central Sulawesi. Java: Indonesia’s most populous island but also the arena where Islamists and Indonesian nationalists have battled over the philosophical basis for the country since the 1920s. The idea of formalizing Sharia took root then, resulting in discrimination against religious and gender minorities, and challenging the idea of Indonesian nationalism. After Suharto’s fall, Islamist politicians in Java revived the idea of recreating Indonesia as an Islamic state. They wanted to change the Constitution to obligate Muslims to follow Sharia and they proposed bans on non-Muslim leaders in majority Muslim areas, sought greater enforcement of Sharia provisions, and pressed for nominating candidates sympathetic to Islamist objectives. Some extremist Islamists have used violence to advance their agendas, including bombings in Jakarta and Bali in 2002 and 2005 that killed hundreds of people. The Moluccas: These islands were the scene of the bloodiest violence in post-Suharto Indonesia between 1999 and 2005. The violence took place on the islands of Ambon, Halmahera, Tidore and Ternate, involving at least 3,000 militants from Java under the Laskar Jihad group. Lesser Sunda Archipelago: These islands span from Timor in the east to Bali, near Java. Those living in the archipelago have experienced violence, especially in East Timor, which was under Indonesian occupation until a United Nations-organized referendum in May 2002. The Commission for Reception, Truth and Reconciliation in East Timor documented at least 102,800 deaths under Indonesian occupation. West Papua: The history of West Papua centers on racism, human rights abuses and the manipulation of the 1969 Act of Free Choice. The American mining company Freeport-McMoRan has long played a role that has affected conditions for indigenous people in Papua and West Papua provinces. Alex Sobel writes on the ongoing military occupation and its gross human rights abuses. We think we know all about the great injustices of the world. The people who have been killed, who have had their human rights transgressed, who have been illegally imprisoned, and have seen their calls for a right to Self-Determination unanswered. We might be familiar with the situations faced by the peoples of Kurdistan, Western Sahara, Kashmir, Tibet and Palestine. However much less is spoken of West Papua even though the International Headquarters of the Campaign to fight for against Human Rights abuses and self-determination is based right here in the UK. West Papua is the Western half of the Island of New Guinea off the North coast of Australia sharing the Island with Papua New Guinea which achieved its Independence from Australia in 1975. However the Western part of the Island which was a Dutch Colony is under occupation by the Indonesian State. The indigenous people of the Island of New Guinea are Papuans of Melanesian descent, quite distinct from the majority of Indonesians. 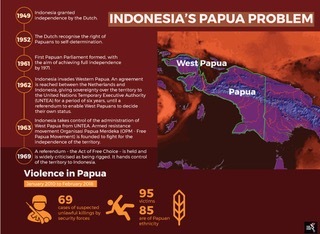 There was a chance for Independence as the Dutch prepared for de-colonisation after the Second World War they included West Papua in these plans. West Papua held a Congress at which its people declared independence, and raised their new flag – the Morning Star in 1961. However Indonesia which had been Independent since 1950 wanted all of the former Dutch colonies in the Asia-Pacific region and the Indonesian military invaded West Papua. As it was the Cold War the Indonesians unable to secure enough support for its invasion of West Papua went to the Soviet Union for help. The US government was worried that Indonesia seeking Soviet support might increase the spread of communism in the Pacific. In a letter from John F Kennedy to the Dutch Prime Minister, the US government strongly urged the Dutch government to hand over West Papua to Indonesia, in an attempt to appease the Sukarno government. The US government managed to engineer a meeting between Indonesia and the Netherlands resulting in the New York Agreement, which in 1962 gave control of West Papua to the United Nations and one year later transferred administrative control to Indonesia. The Papuans were never consulted on this decision. However, the agreement did promise them their right to self determination – a right which is guaranteed by the UN to all people in the world. The Indonesians used the next 7 years to gain control over all aspects of West Papuan life and in 1969 the promised plebiscite on Independence came. However rather than a vote of all people in West Papua the Indonesian military hand-picked just 1,026 ‘representative’ people who voted under duress and West Papua became a province of Indonesia. In the 50 years of Indonesian Control there is significant evidence of Genocide and Yale Law School in a report for the Indonesian Human Rights Campaign in 2004 found “in the available evidence a strong indication that the Indonesian government has committed genocide against the West Papuans”. The Indonesian Military have also carried out widespread acts of Torture and Sexual Assault against the native Papuans. Every week those protesting for their rights are imprisoned by the Military. You may now be asking yourself why haven’t I heard about this, why isn’t this on the news? Well reporting is banned, Journalists cannot travel to West Papua and Journalists that have tried have been expelled. In February 2018 the BBC sent a Journalist to cover the Measles and Malnutrition Crisis that engulfed West Papua was expelled by the Military before she could even file a report. Without any reporting the plight of the West Papuans needs to be carried by word of mouth and Social Media. West Papua is rich with natural resources it has the world’s largest Gold Mine and second largest Copper Mine. West Papua has also seen mass deforestation with the native trees being replaced by Palms for Palm Oil production. West Papuans are being exploited for their labour, land and their Island is being destroyed by pollution of the land and rivers. However the West Papuan people sat in the midst of all these resources are some of the poorest people in Asia. Papua was formerly a Dutch-controlled colony and had since been annexed by Indonesia in 1963. However, strong separationist sentiments still prevail on the Indonesian half of the island and the freshly concluded elections there served as a catalyst for spates of violence similar to those which occurred in July last year. 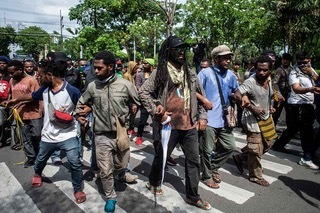 Indonesian security forces often clash with armed Papuan rebels although President Joko “Jokowi” Widodo has arguably given more attention to the region compared to other presidents since the Soeharto administration. Nevertheless, according to a report by Jakarta-based Institute for Policy Analysis of Conflict (IPAC), Jokowi’s government has made several policy miscalculations there. The first miscalculation is the belief that economic development would remedy any political grievances especially self-determination efforts. This is because development does not always translate to poverty alleviation. Hence, Papua remains the poorest province in the country. Besides that, in spite of other measures to lower prices of basic goods, empower Papuan women and increased access to education, the independence movement in the province has only grown stronger. This shows that higher levels of income and education do not necessarily translate to greater loyalty to the Indonesian state. The second miscalculation is that outstanding human rights cases could be quickly resolved thus contributing to increased trust and goodwill on all sides. Violence in Papua has stemmed primarily from the extrajudicial actions of security forces who only receive a slap on the wrist from the government. According to a report by Amnesty International, such unlawful killings have even taken place when security forces have had to deal with peaceful political protests, such as the Morning Star flag-raising ceremony – a symbol of Papuan independence – as well as religious gatherings. The report revealed that close to 100 people were unlawfully killed in a little more than eight years between January 2010 and February 2018. In reference to several cases of extrajudicial killings, Usman Hamid, Amnesty International Indonesia’s Executive Director stated that it demonstrates the failure on the part of Indonesian security officers to distinguish between peaceful and armed protestors. “The police and military must change their approach in dealing with peaceful political activities,” he said. Will elections change Papua’s fate? The final blemish on Jokowi’s policy towards Papua is the failure to reform the system of local elections there. The existing network of patronage and money politics have coloured local elections in Papua for a long time resulting in a repugnant spectacle of corruption that at times is tainted with violence which Jakarta has never attempted to prevent. Indigenous-migrant tensions are a perennial point of contention. There have been calls for a requirement that only indigenous Papuans qualify to run as candidates for local elections. This issue also played out in the race for governor previously, where both candidates are indigenous. Lukas Enembe has always been a strong advocate of indigenous rights but his competitor, Jhon Wempi Wetipo had better support among the migrant community which could have played a crucial role in the final outcome in the event of a close election race. Nonetheless, it was Enembe who came out victor with a whopping 67.5 percent of the vote. His strained relations with Jakarta is believed to have been a key factor to his continued popularity. Over the years, he has built a strong political machine – even by means of political patronage – and enjoys the backing of many who are in support of pro-independence efforts. His re-election could spell further complications between Papua and Jakarta and the only way around it could be a compromise by both parties. But whether there is sufficient political will to achieve that, remains to be seen. This article was first published by The ASEAN Post on 2 July 2018 and has been updated to reflect the latest data.